Agios Gordios lies at the west side of the island and boasts one of the most beautiful sandy beaches, which is surrounded by impressive and magnanimous rocky formations, creating an amazing landscape. Surrounded by olive trees in a perfect green area with mountain view, Angelica hotel is only 410m away from the impressive sandy beach of Agios Gordios. Sun beds, umbrellas and water sport facilities are offered in Agios Gordios for you to enjoy the days at the beach. Within a 30 to 50 minute distance from the hotel you can find Super Markets, Car rentals, Travel Agencies, Bus Station, Taxi station, Tourist Shops, Clinic, Taverns, Restaurants & Bars. 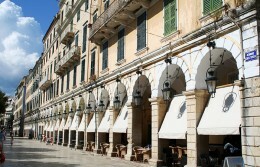 Corfu is the most popular of the Ionian Islands. Mixing nature’s green with the sea’s and sky’s blue, Corfu is an amalgam of the civilizations that have passed through at various times. The visitor will be amazed by the island’s history and culture, the natural beauties, traditional features and archaeological sites. The town of Corfu charms the visitor with its old castle and the fort, the narrow streets and the Venetian built tall houses and narrow streets. The amazing beaches, the picturesque villages, the cosmopolitan way of life render Corfu a small paradise on earth and that is why for years and years Corfu has been the most popular destination for holiday makers from around the world. The 17 km distance from Corfu town protect the area from the city’s potential annoying fuss , while the 20 minute drive by car connects you with the services and the enjoyments that the town can offer. The distance from Corfu International Airport I. Kapodistrias is only 15 km.